Jewish and Arab MPs in Jerusalem are often at odds, but they joined forces this week in protest at a common enemy -- a massive gay pride rally which they fear will tarnish the reputation of their ancient holy city. "The residents of Jerusalem are attracted by the unique character of this city. There is no reason to harm this singularity for a simple exhibitionist desire," said MP and rabbi Yitshak Levi, quoted in the top-selling Yediot Aharonot daily. Levi and Ibrahim Sarsur, an MP from the United Arab list, spent the past few days circulating a petition among Israeli deputies calling for the gay pride parade to be cancelled. World Pride 2006, a week-long festival and rally for gay, lesbian, transsexual and transgendered people, is planned for August 6-12. The last such event, in Rome six years ago, drew around 500,000 people. A poll conducted at the urging of the two MPs suggested that only 12 percent of Jerusalemites support the gay rally and that 69 percent oppose it. Many in largely conservative Jerusalem, which has a strongly religious and traditional make-up, believe the festival is a sacrilegious event that would only defile the nature and character of the city, holy to three faiths. The ultra-Orthodox community is not the gay pride rally's only opponent. Most lay residents and even some political parties that typically support the gay community have joined the ranks of those who want the event axed. Sarsur said 92 percent of the Arab population of Jerusalem does not want the gay parade to take place in their city. Palestinian society has a zero-tolerance policy towards homosexuality. Homosexuality was illegal in Israel until 1988, and there are still many sectors of society which do not tolerate it. "This is about a pride that is shameful and misplaced and which encourages exhibitionism," Rabbi Henri Kahm told AFP. A petition opposing the gay rally has drawn 24 signatures among the 31 members of the city council. Several anti-gay demonstrations are planned around the event, including a so-called "humility parade". Three Christian groups in Jerusalem have urged the Israeli authorities to reconsider the authorization granted to organizers. "We support any action brought by the Jewish community in order to cancel this event," a representative of the International Christian Embassy told AFP. Gay rights advocates and religious leaders engaged in a stormy debate Tuesday during a session of the Israeli parliament, or Knesset. And tensions threaten to erupt even further. During a recent local gay pride march in Jerusalem, an ultra-Orthdox Jew punched one of the participants. A man and two women taking part in last year's annual gay parade were stabbed by an ultra-Orthodox Jew. 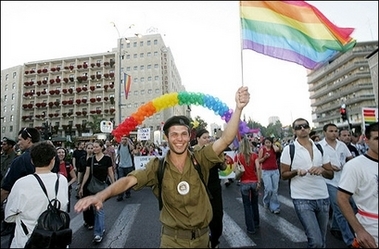 The world gay pride event was initially scheduled for last year in Jerusalem but was postponed to 2006 because of the Israeli pullout from the Gaza Strip. However, a spokesman for the Israeli gay community has vowed that any cancellation of the event this year is out of the question. "Jerusalem Open House", one of the most active gay rights groups in the Middle East, expects tens of thousands of people to converge on the city for the event, which will include street festivals, parties, religious observances and a gay film festival. "In these times of intolerance and suspicion, from the home of three of the world's great religions, we will proclaim that love knows no borders," the event's web site said.